Almo Nature Legend Kitten - Chicken understands that kittens have specific nutritional needs during their growth phases. This supplementary wet cat food contains 50% fresh chicken of human grade quality, which acts as a high-quality, easy-to-digest single source of protein. The gentle preparation method uses the recipe's own stock to natural preserve the micronutrients found in the ingredients. The natural flavour and juicy recipe makes it extremely well accepted. Alongside chicken as the sole source of animal protein, this recipe contains highly-digestible rice, cheese and egg. 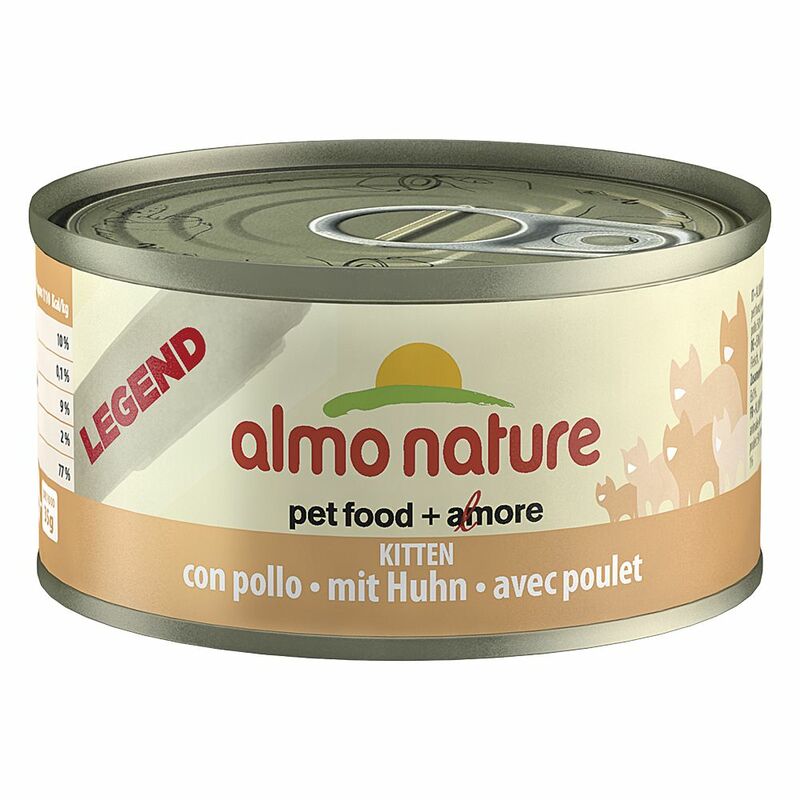 This provides Almo Nature Legend Kitten - Chicken with a high nutritional profile to provide your kitten with all the valuable nutrients it needs to grow into a healthy adult cat. It is grain- and gluten-free, meaning it is even suitable for cats with intolerances. This natural supplementary food is also free from artificial additives such as colours, flavours and preservatives. Almo Nature Legend Kitten - Chicken 6 x 70g at a glance: Supplementary wet food for growing kittens With 50% fresh chicken: finest quality meaty chunks of human grade quality Single source protein: chicken as the only source of animal protein Natural: gently prepared and preserved in its own stock, making it particularly tasty and digestible High nutrient density: the manufacturing method preserves natural proteins and micronutrients that your kitten needs for growth Gluten- and grain-free: with easy to digest rice, making it suitable even for sensitive kittens Well accepted: thanks to a high meat content and species-appropriate, juicy recipe Free from artificial additives Please note: Almo Nature Kitten food is entirely natural. It contains its own proportions of vitamins, minerals (e.
g. calcium, phosphorus) and taurine. The varying nutrient contents of this variety will ensure a balanced diet for your cat. Almo Nature is a supplementary cat food.